Charles Conder (Australia/Britain, 1868  1909), Dandenongs from Heidelberg, c.1889, Melbourne. Oil on wood panel, 11.5 x 23.5 cm. M J M Carter AO Collection through the Art Gallery of South Australia Foundation 2012, to mark the 123rd anniversary of the '9 by 5 Impression Exhibition', August 1889. Donated through the Australian Government's Cultural Gifts Program. Art Gallery of South Australia, Adelaide. ADELAIDE.- The largest group of 9 by 5 paintings ever given to an Australian public institution has been generously donated to the Art Gallery of South Australia by the benefactor Max Carter, AO. Valued at nearly $3 million these four remarkably rare 9 by 5 paintings are now permanent highlights of the Elder Wing of Australian Art and form a cornerstone of the Art Gallerys celebrated Australian Impressionist collection. 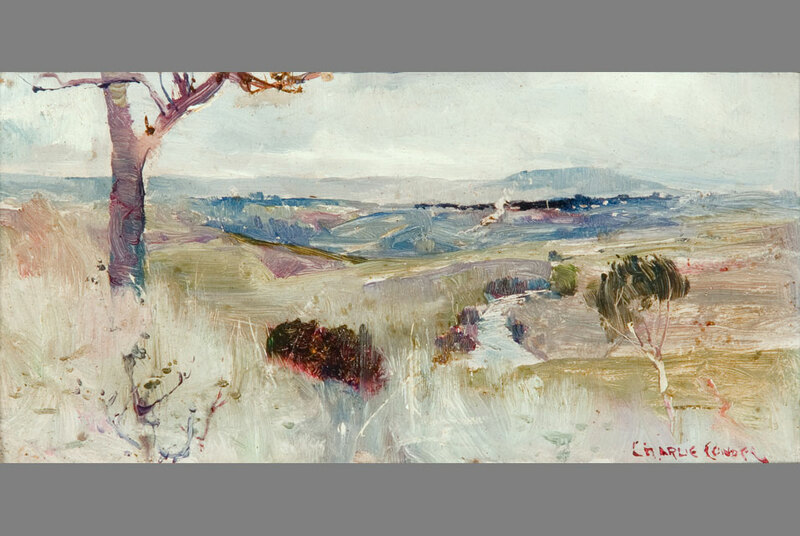 This major gift, given to mark the 123rd anniversary of the now legendary 9 x 5 Impression Exhibition, includes Charles Conders A Dream of Handels Largo and Dandenongs from Heidelberg, Tom Robertss Andante and Arthur Streetons Orange, blue and white (portrait of Keith). The name 9 x 5 is taken directly from the measurement of the works, many of which were painted upon cigar box lids of that scale. First exhibited at the 9 by 5 Impression Exhibition in August 1889, these works redefined Australian painting for generations and turned the Heidelberg artists into household names. Max Carter AO is one of the Art Gallery of South Australias greatest living donors. For more than forty years he has been involved in the Gallery, and has built a collection to rival no other. He has generously donated works from this collection to the Gallery over many years, and is extraordinarily altruistic on all Gallery matters. Never did I think that I would have a collection desirable to the Gallery. I have simply acquired each work because I loved it, much like a family loves every one of their children and it gives me great pleasure to be able to gift them not only to the Gallery but to the people of South Australia, said Mr Carter. Charles Conders A Dream of Handels Largo and Dandenongs from Heidelberg, Tom Robertss Andante and Arthur Streetons Orange, blue and white (portrait of Keith) are now on permanent display in Gallery 3b of the Elder Wing of Australian Art.